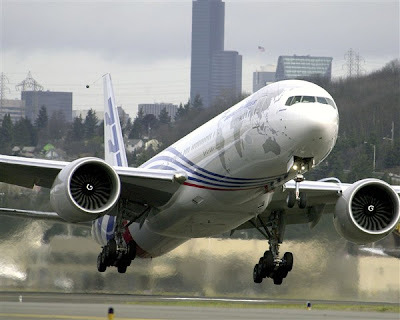 The news that Boeing have over 130 orders for an upgrade pack to older versions of their 777 airliner that offers fuel savings of 1% is no surprise given the increases in the price of oil over the last few years and greater competition between carriers. 1% may not seem much but it could save $300,000 per year per aircraft. Its part of a growing effort to push for greater fuel efficiency of new airliners and improving existing airliners, especially the older aircraft in airline's fleets. American Airlines for example are fitting new tail cones to their McDonnell Douglas MD-80 to reduce fuel use via less drag (and happily thus CO2 emissions). Many efforts to save weight are ongoing, even down to lighter cutlery for the inflight meals. Its not just the hardware. How airliners fly, and especially land, is also being looked at. ECO-Descend for example allows a pilot to slow down if they are ahead of schedule. Aircraft may also be able to choose their own flight path, a system to allow this is to introduced in Sweden this year. As oil continues it's rise airlines and airliner manufacturers no doubt will continue their efforts to save fuel. In the next decade we should see the arrival of geared turbofans for example (which i will look at in more detail later).